True Potential One® is our financial planning system that consolidates all of your savings and investments into one convenient location. We believe in simplicity and empowering clients to reach their investment goals, and True Potential One® offers both. Over the course of your life, it’s easy to end up with various investments here, there and everywhere. You might have an ISA with one provider, a Pension with another and a GIA somewhere else. With True Potential One®, you can bring all of those investments together. It’s like having one big bank account for life, with smaller accounts inside for every eventuality. True Potential One® helps you look at your finances as a whole and set multiple goals, whilst keeping your investments working together. Whether it’s saving for a house deposit a few years from today or investing for your retirement, all your goals work together. It’s like any journey, if you want to reach your destination, you need to know how much you have in the tank. Plus, if you want to reach any of your goals sooner, or want to address a shortfall, you can top up funds with impulseSave® whenever and wherever you want. Of course, things will change along the way, so as the goalposts move, you can simply adjust your plan and update it whenever you want. Most financial planning for the future involves picking a figure out of thin air – one that you think will see you through your twilight years. But what if you live a lot longer than you think you will, or you want to see and do so much more than your initial plan allows for? We think it’s far better to be able to plan your future spending in great detail, as well as have the flexibility to adjust your plan when things change. Once you’ve thought about your future spending, it’s so much easier to work backwards to the present and devise a financial plan that helps deliver the lifestyle you want in your retirement. That’s why our unique life planner looks at your life as a whole. 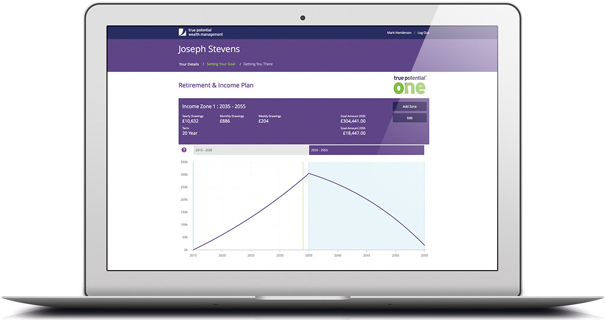 True Potential One® makes your spending plan more realistic by breaking down your retirement into phases. Maybe you want to go travelling in your 60s, take lots of city breaks in your 70s and slow down in your 80s. You’ll spend more money early on and less as you get older. This kind of planning builds a much more accurate picture of what you’ll spend in retirement and how much money you’ll need to make it a reality. Watch our video to see how we built True Potential One® and why it makes financial planning easy. 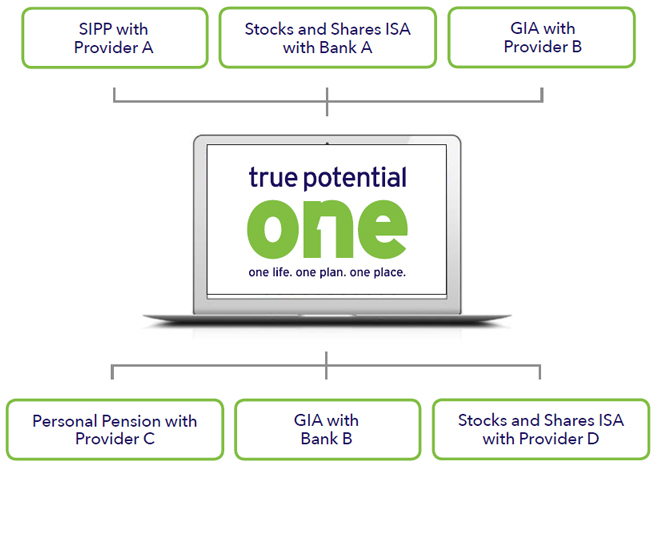 If you’d like to consolidate your investments and plan for a life beyond retirement, True Potential One® can help. Get in touch with me today to set up a free, no-olbigation meeting. Your capital is at risk. Investments can fluctuate in value and you may get back less than you invest. Past performance is not a guide to future performance. Tax rules can change at any time. I offer advice on limited types of products. Primarily, I will advise on strategy funds and tax wrappers held on the True Potential Wealth Platform. In circumstances where the True Potential Wealth Platform does not have a product to meet your needs, I will broaden my research to other companies with products not available on the True Potential Wealth Platform. You may ask me for a list of those companies. True Potential Wealth Management LLP is authorised and regulated by the Financial Conduct Authority. FSR No. 529810. www.fca.org.uk. The Financial Conduct Authority does not regulate will writing, buy-to-let mortgages, tax advice or estate planning. Registered in England and Wales as a Limited Liability Partnership No. OC356611. impulseSave® and True Potential One® are registered trademarks of True Potential Investments LLP. Privacy Statement | © 2019 True Potential LLP. All rights reserved.